So Raphael was sent to heal … to give Sarah, the daughter of Raguel, as a wife to Tobiah, the son of Tobit, and to rid her of the wicked demon Asmodeus. 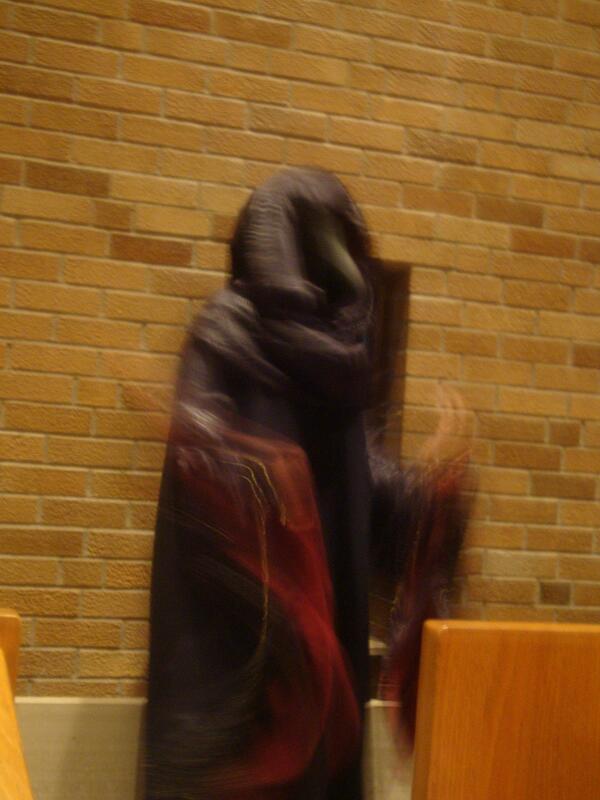 My friend John captured this blurred image of Asmodeus, who appears lurking around Sarah. Hopefully the audience gets the drift that the demon is invisible to the characters. The image is serendipitous, in that if we could show the demon as a blur of action, that would be closer to my ideal. Perhaps in the film version. As it is, the blend of blood red and black, the inhuman beak, and the hand that deals death: this image may be imperfect in focus, but it depicts the nature of evil all too well. This entry was posted in Art, Parish Life, Scripture, Tobit, Todd's music. Bookmark the permalink. Is this going to be up anywhere to watch?